Twitter and leading global technology company LeEco announced today a joint business partnership to grow LeEco’s global influence through the world’s leading live communications platform. The advertising partnership will provide access to campaign-based analytics and custom research, strategic advertiser tools and resources, and first-to-market advertiser innovation in 2016. For example, LeEco will be one of the first brands from China to get access to First View, a new video-based advertising product from Twitter, to reach a globalaudience. Twitter’s new First View helps marketers achieve significant audience reach with exclusive ownership of Twitter’s most valuable advertising real estate for a 24-hour period. When users first visit the Twitter app or login totwitter.com, the top ad slot in the timelines will be a Promoted Video from that brand. Now, marketers can tell a powerful visual story across the Twitter audience. 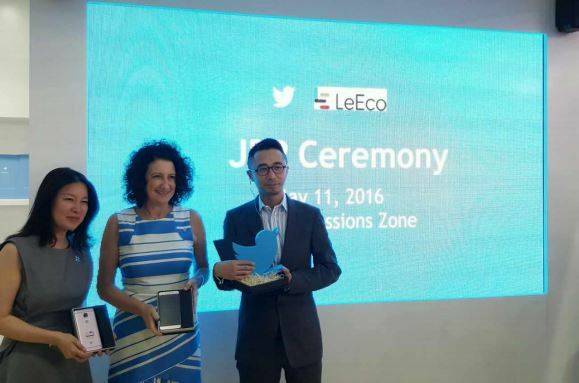 LeEco’s global Twitter handle is @LeEcoGlobal and LeEco targets specific markets like India through @LeEcoIndia. in Beijing, China, it has regional headquarters in Hong Kong, Los Angeles and Silicon Valley.